Download and add MAKE ME WANT to your TBR pile on Goodreads! Then keep reading to get a sneak peek excerpt and enter the giveaway for a $25 Amazon gift card! I am a big fan of Katee Robert and her books and I was really looking forward to this new series and, while Make Me Wantwas a good read I have to say that for me it wasn’t one of KR’s best ….maybe it’s down to the fact that it’s a different line and seems a little more mainstream, I’m not sure but, even though I felt that way about the book, I still enjoyed it for the most part. I liked the premise behind the story and you could see how things were gonna go but that old communication – or lack of it – issue threw up problems for the pair. I loved Gideon, he was quite the leading man and I liked that once he had his eye on Lucy being his prize he was determined to go for what he wanted… until he didn’t! For a big, successful, confident businessman, at points, he wasn’t so sure of himself when it came to Lucy. Lucy had had her fair share of bad luck when it came to love and she set out on a path to ensure she knew what was coming in her personal life so she couldn’t get hurt again but wasn’t prepared for how she’d feel about Gideon… and while for a lot of the book she was confident and on the same page as he was, there were times when I wished she’d woman-up and believe in herself more. A good read and I’m looking forward to Make Me Crave which is Roman’s story. 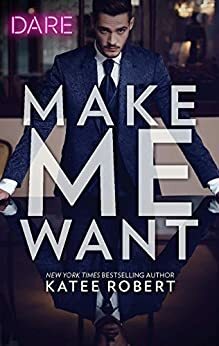 Posted on 09/03/2018, in Authors & Books, Blitz, Blurb, Buy Links, Endorsements, Excerpt, Favourites, Giveaway, New Releases, Recommended, Reviews, Teaser and tagged #Dare, #MakeMe, #MakeMeWant, @Barclay_PR, @katee_robert. Bookmark the permalink. Leave a comment.